Join Viking for an experience that comes along once every decade. Witness the trial, suffering and death of Christ in The Passion Play in Oberammergau. Cruise the fabled Danube, gazing upon the ecclesiastic artwork and heavenly hilltop setting of Göttweig Abbey, Austria’s revered monastery. Step inside the hushed interiors of Vienna’s St. Stephen’s Cathedral. With medieval towns, grand cities and hallowed sites, this 10-day cruisetour is sure to inspire. Welcome to Munich, the historic capital of German Bavaria. Transfer to your hotel from the airport. * After settling in, take time to explore the Marienplatz, the city’s main square overseen by the magnificent ornate facade of New Town Hall. 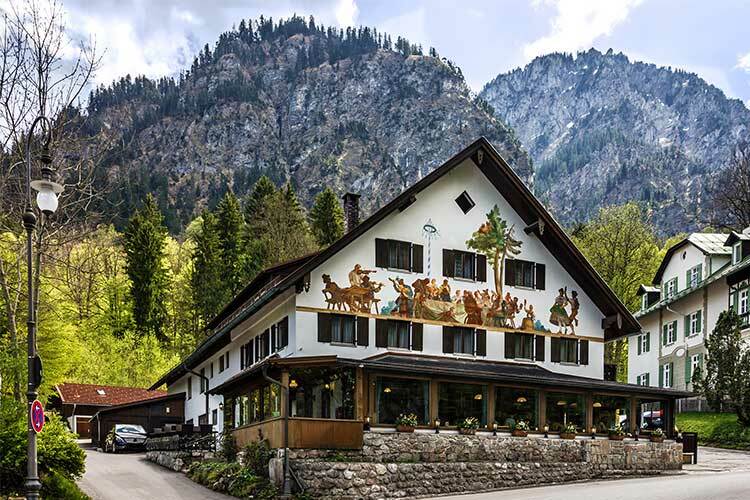 Journey to the charming hamlet of Oberammergau today, where you will enjoy a performance of Passionsspiele, The Passion Play. This depiction of the trial, suffering and death of Christ is performed once every ten years, keeping the terms of a promise the townspeople made to God after they were spared from the plague in 1633. Today, many of Oberammergau's residents still take part in this powerful work of art featuring dramatic performances, beautiful music and choral accompaniment. The play takes place in two parts this afternoon and evening. Enjoy an included traditional dinner during the three-hour intermission. After a leisurely morning transfer to Nuremberg, Bavaria’s second largest city, you will embark your ship. After boarding, you have free time to stretch your legs and explore the city a bit on your own. Your morning tour of Nuremberg includes a drive to the ruins of Zeppelin Field, the Nazi parade grounds of the 1930s, and Congress Hall. You will also drive by the Palace of Justice, the venerable vestige of the Nuremberg Trials. Then, visit medieval Nuremberg Castle. Your tour comes to a close with a walk from the imperial palace grounds, past the Albrecht Dürer House and on to the Main Market Square of Old Town, enclosed within ancient city walls. Alternately, you can join an optional World War II tour. Visit Zeppelin Field on foot, see Congress Hall and spend time at the illuminating Documentation Center Museum. After, visit Courtroom 600 at the Palace of Justice (unless court is in session) before heading into the historic area surrounded by the city’s medieval walls to explore Nuremberg’s Old Town. 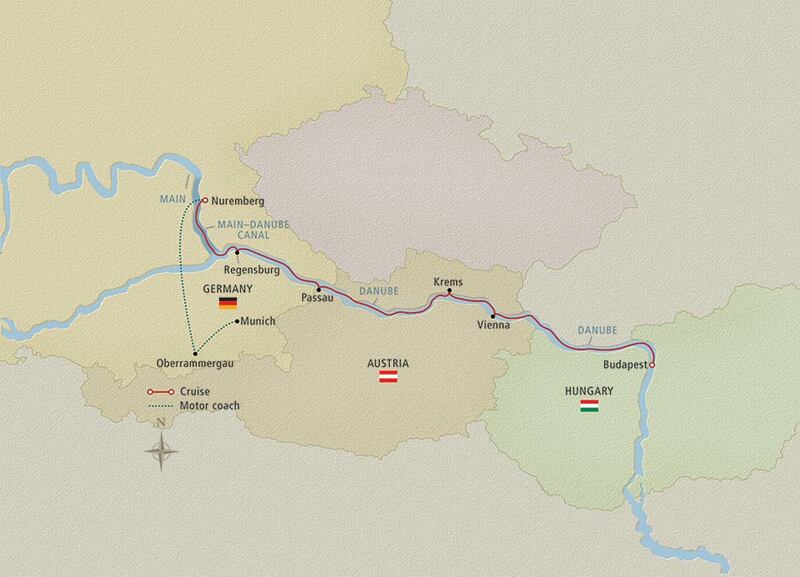 After lunch on board your ship, enjoy a leisurely afternoon sailing the Main–Danube Canal. An engineering marvel, the canal stretches 106 miles from Bamberg on the Main River to Kelheim on the Danube, enabling river travel from the North Sea to the Black Sea. Dinner is served on board while we cruise through the night. This morning, meet your local guide for a walking tour through the scenic town of Regensburg. See one of the largest groupings of 13th- and 14th-century church spires, towers and patrician houses north of the Alps. You also encounter the 12th-century Old Stone Bridge, St. Peter’s Cathedral and a number of idyllic courtyards. Alternately, you may instead choose to join an optional excursion to Kelheim, located at the southernmost point of the Main–Danube Canal. Travel by road to Kelheim, then cast off on a ferryboat ride to marvel at the 400-foot chalk cliffs and dramatic scenery of the Danube Narrows. You will also visit the renowned Weltenburg Abbey*, famous for its dark ale, brewed here by monks since 1050. Upon your return in the afternoon, you will have the opportunity to enjoy the same included walking tour of Regensburg that was offered this morning. Or, you may choose instead to sample some of the excellent local beer on an optional excursion to explore the brauhaus culture and Bavarian microbrews. Rejoin your ship for dinner. We depart late this evening. Arrive this morning in Passau, at the confluence of the Inn, Ilz and Danube Rivers. Your guided walk along the town’s narrow streets takes you through Old Town and past traditional patrician houses. See the New Bishop’s Residence and visit the impressive baroque St. Stephen’s Cathedral with its ornate interior. Inside, you are treated to a special concert played on the 17,000-pipe organ, considered Europe’s largest church organ.† Enjoy lunch on board your ship, and return to the city for further exploration on your own. Alternately, you may instead choose a full-day optional excursion to explore glorious Salzburg; visit the Italianate Old Town, see settings from the film The Sound of Music and enjoy lunch at Austria’s oldest restaurant. Return to your ship for dinner and departure. We cruise through the night. This morning, cruise leisurely through the captivating Wachau Valley, a UNESCO World Heritage Site, spotting attractive riverside towns and castle ruins along the way. After lunch, disembark in Krems and visit Göttweig, a working Benedictine abbey that owns many of the vineyards along the Danube. The splendid ceiling fresco in the imperial stairwell is one of the largest in the world. Visit the church, a masterpiece of baroque architecture. Rejoin your ship and continue cruising through the splendid Wachau Valley. Arrive in Vienna after dinner and enjoy a relaxing evening. Or, you may choose one of this evening’s optional excursions: experience a classical concert in the “City of Waltzes,” or head to the famed Grinzing district to join locals in a high-spirited Heurigen celebration of the year’s wine vintage. Today we tour the Austrian capital of Vienna. Ride along the Ringstrasse, which replaced the city walls in the mid-19th century. See some of the city’s baroque architecture, including the world-famous Opera House, St. Stephan’s Cathedral and Hofburg Palace. Return to your ship for lunch. The rest of the day is yours to further explore. Or, you may join us for an optional excursion to visit Schönbrunn Palace, erected in 1778 and admired as the “Versailles of Vienna.” Alternately, you may choose a full-day optional excursion to explore Vienna’s elegant architecture and visit its celebrated Museum of Fine Arts; you will also enjoy a horse-drawn carriage ride along the Ringstrasse. Dinner is served on board. Arrive in Budapest, Hungary’s vibrant capital divided by the Danube River. Take a panoramic city tour through the more modern Pest side of the city. Journey along Andrássy Avenue and see the 19th- and 20th-century mansions, National Opera House, Parliament Building and Chain Bridge. Stop in Heroes’ Square to learn more about Hungarian history, then cross the Danube to Buda’s Castle District. Visit Matthias Church and enjoy brilliant views of the Danube and the beautiful Hungarian Parliament building from Fishermen’s Bastion. Return to your ship for lunch; the rest of the day is yours to explore both sides of the city. You may also choose to join us on one of several optional excursions designed to reveal this fascinating city’s culture, history and cuisine in greater depth. After breakfast, disembark and proceed to the airport for your return flight. * Or, extend your journey with 2 additional nights in Budapest, giving yourself more time to explore the bustling Hungarian capital. Terms and conditions apply. All offers are subject to availability and operators booking conditions. Prices are based on two passengers sharing the lead in grade stateroom unless otherwise stated. All savings are included in the fares shown and were correct at time of print, but are subject to change. ^Itinerary operates in reverse, please call to confirm. *Savings of 500pp on 2019 Viking River Cruises PLUS free gratuities and Silver Spirits Beverage Package are applicable to new bookings only made by 31st December 2018. Savings of £1,000pp is only available on selected 2020 Viking River Cruises* Call 0800 810 8220 to secure your cabin!We charge a one-off small £20 booking fee. That’s it - nothing more and no add ons when you pay the balance. E&OE. ABTA P6710.